Over 5,000 square feet of our laboratory facilities and state-of-the-art equipment are housed in the Life Sciences Building at Rutgers University, Busch Campus in Piscataway, New Jersey. The Kohn Lab offers technical resources for the discovery and development of new biomaterials, processes and devices. The Lab is well equipped with instruments that enable exciting research focused on polymer design, synthesis, characterization and biomedical applications. The dominant themes are tissue engineering and drug delivery technologies. enable the multidisciplinary efforts necessary for biomaterials research. Design, synthesis and kilo scale-up of polymers. Resource for increasing the batch size of polymers for medical applications; both melt and solution polymerization techniques; benchtop and walk-in hoods to allow several chemists to work simultaneously; reaction vessels of approximately 22 liters. · Chemspeed Synthesis Accelerator. Fully automated state-of-the-art SLT100 Accelerator work station allowing the simultaneous parallel synthesis of up to 192 separate reactions. The automated synthesizer has capability to carry out a) Synthesis of a complete polymer library in small quantities; b) Synthesis of a focused polymer library with sufficient sample size to conduct extensive characterization; c) "Up-scaled" synthesis of a small group of selected polymers. 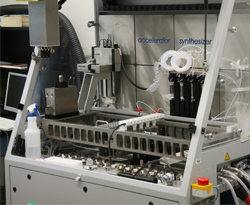 The automated platform is currently one of three in a US academic setting with RESBIO's having the unique focus of parallel synthesis of polymeric biomaterials. The Accelerator facilitates the exploration of optimized reaction conditions allowing for hypothesis-driven work flow that rapidly screens parameters such as reagent amounts, mixing and stirring, reaction temperature and time. Expansion of the platform to include rapid analysis of reaction mixtures (using GLC or LC/mass spectroscopy) is possible. Automated synthesizers are common in industry, but the Kohn Lab is one of only three academic laboratories who have access to this technology. The SLT100 Accelerator is manufactured by Chemspeed, Basel Switzerland. This advanced instrument performs intelligent dispensing of liquid and solid reagents with excellent precision, temperature control from –20 to 150 degrees Celsius, vortexing, purification by filtration, and solvent removal.